This awesome summer floral dress with cut-out shoulders looks amazing styled with camel brown suede tote and black leather booties. Make it fun and youthful by teaming navy blazer with light grey tee tucked in high-waisted mini floral skirt. Finish the look by adding brown satchel and open toe black heels. Black blazer looks fantastic worn atop floral shirt tucked in matching pants. Love the combination. Of course, it looks bold and sophisticated. Another great outfit for those ladies who love vibrancy. Finish the look by adding pointed-toe black pumps and statement sunglasses. I would say it's kind of playsuit, but it's a summery look that consists of a spring floral shirt tucked in high-waisted matching print shorts. I love the rounded modern sunglasses, fuchsia clutch and silvery shiny flat mannish shoes. If you do like abstract prints, then go for this collarless long-sleeve coat-dress styled with black open-toe leather booties. 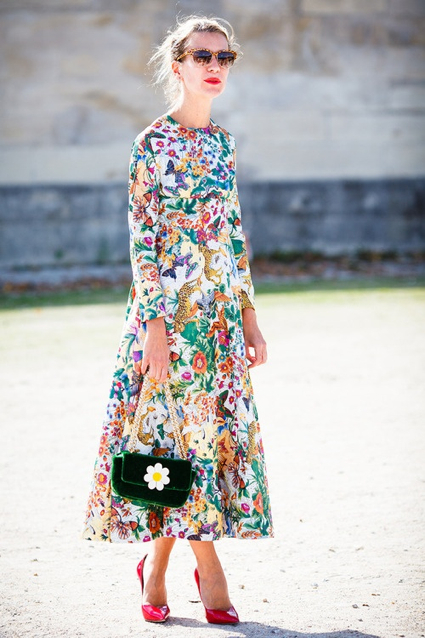 How about wearing a three piece skirt-suit that is totally printed in florals. Go for a printed sweatshirt and style it with fur coat, vibrantly printed pants, pale pink leather handbag and tortoise sunglasses. love the floral necklace. The slim-fit floral tee looks awesome tucked in high-waisted midi skirt. Love the tassel black high-heel sandals and violet color rounded eyewear. Make some fun with urban street look. Go for a simple floral top and combine it with black leather jacket, skinny black pants, black sneakers and rounded hippie sunglasses. Simple shift look perfect styled with grey leather shoulder bag. Finish the look by adding golden jewelry. How about wearing this urban pantsuit during the weekends. Love the pale yellow shoes and white tee. 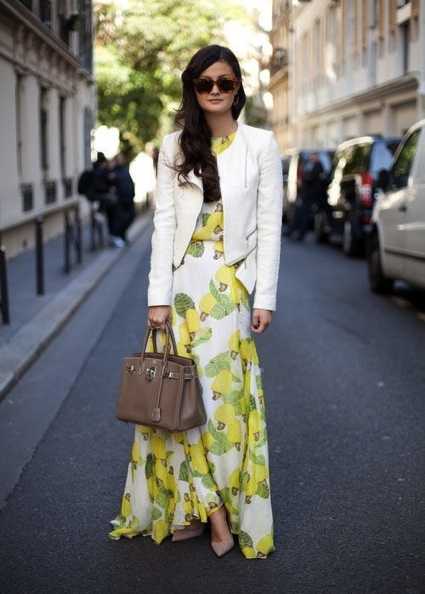 You can always mix up the white leather jacket with your favorite floral maxi gown. Another great look that is a perfect choice for open-minded ladies. Love the lightweight feel of this ensemble. Ankle-length long-sleeve frock looks retro inspired worn with dark green velvet clutch and patent fuchsia pumps. Go classy and bright with floral pants that can be combined with chic black jacket and yellow top. Love the light brown leather tote and leopard pumps. Another urban inspired floral pantsuit is covered by a light cream white coat. Here we see a gorgeous weekends dress that is printed in yellow roses. Love the skinny yellow belt. Rich shiny green shirt is tucked in flared floral summer skirt cinched at the waist with a skinny violet belt. Keep it abstract and fun wearing this long-sleeve dress. Love the fir and the way it's styled with glossy pointed-toe black booties. The stand-up shirt looks great with straight fit pale yellow skirt. Love the shoulder bag and strappy shoes.